I love travelling, visiting new places and meeting new people. Sometimes I love to talk to even strangers and some days, I just want to be quiet in my own cave and prefer not to go out or talk. Well, these are just phases of life. Going out definitely fills you with energy and positivity for life, specially when you exchange smile with strangers and yes I do love giving compliments to others. I am sure there will rarely be someone who doesn’t like compliments. I love getting lost on the ways, specially when we are out for long drives. As the ways and paths, God takes you on, are more beautiful than the pre-planned ones and it takes you to a more wonderful place. But yes, there should be GPS to take you to the correct path after wandering on the lost path. It is like life, we sometimes lose our path but the path God introduces us to, is more beautiful. Even in that case we should be having a plan to carry forward with and not leave everything on god, a plan which takes you to the desired road, just like GPS. I have learnt to enjoy the colors of life and always take sad times and mistakes as lessons. Also I try to stay away from negative people. Negative in the sense who keep on disrespecting others and making fun of others and in reality they themselves are next to nothing. I may be bitter on this one but I don’t like such people. We all should learn to admire others, to appreciate others and help as well when we can. A view like this makes life more adorable and worth loving. It’s not about how many friends you have but how many real people you have in your life. One real and true person is better than ten fake friends. In these pictures I am wearing a saree gown which is a mix of indo western and very easy to wear and carry. I tried my hair to do an updo but it was not exactly what I thought of. This journey ends here. I will come up with something new soon. Love that saree gown, The colours combo is absolutely awesome. You look great. I love talking to just about anyone I meet too… I have come to the same conclusion you have about being better to have one true friend then a bunch of fake friends. You look amazing! Love the post girl. this outfit is so pretty and you are looking fab. 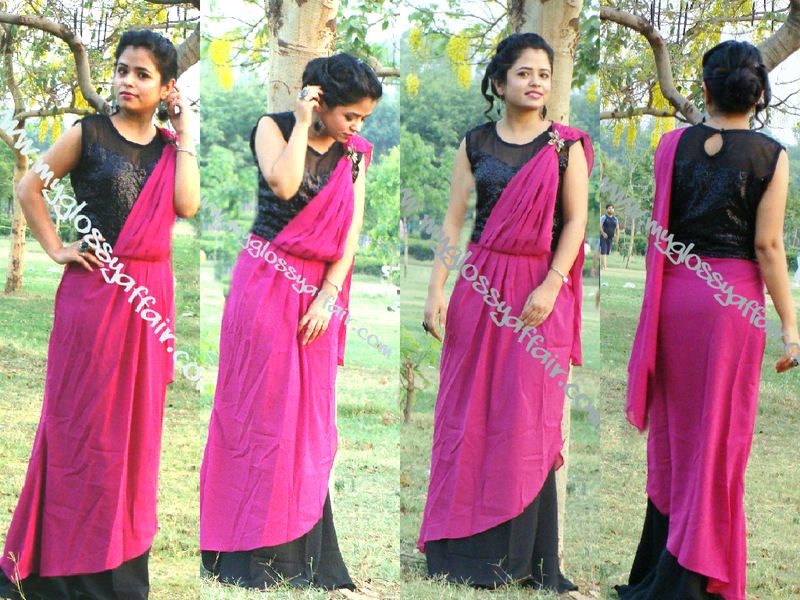 Great blog ..Looking nice with wine color saree. I wear wine color in some special occasion..You can buy lehenga saree online.